Garrett Park Nursery School (GPNS) is a parent owned and operated nursery school founded in 1953 in Garrett Park, MD. The 2016 - 2017 school year marks the 63rd anniversary for the school. 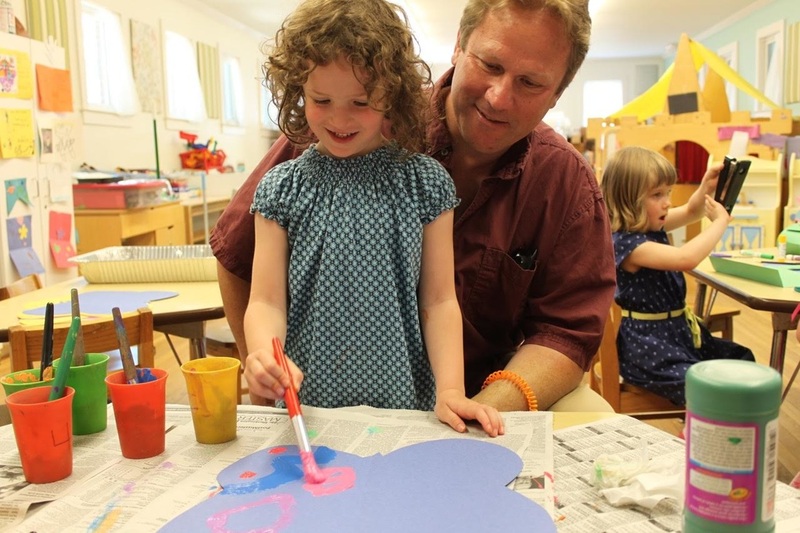 GPNS offers a high quality education for 2, 3 and 4-year-old children, and a pre-school extended day program. The school is located next to the Garrett Park Elementary School in the Garrett Park Community Center at 4812 Oxford Street. The classrooms are spacious and well equipped with materials to encourage the spontaneity and creativity of each child. The school setting includes: sand and water tables, easels and art supplies, housekeeping and dress-up areas, a reading corner, science center, work bench, and a loft play area. Also available are blocks, play-dough, and puzzles, as well as other equipment appropriate for other large and small motor activities. The shady, fenced outdoor playground includes swings, a slide, a sand box, a climbing structure, riding toys, and open space. We believe that every child is unique and should be allowed to develop at his or her own pace in a warm, encouraging and stimulating atmosphere. We believe that children learn through play, and we want each child's earliest school experience to be positive and successful. Our program strives to encourage each child to develop a strong, positive self-image and skills for successful interaction with other children and adults. In a cooperative nursery school, the child benefits from a more gradual separation from home and from the opportunity to interact closely with a variety of interested adults with different skills, talents and enthusiasms. Parents benefit from the opportunity to work under a teacher trained in early childhood education and to observe the ways in which other adults interact with young children in various situations. In addition, it can be helpful to the parent to observe the behavior of other preschool children. ﻿The Garrett Park Nursery School program of early childhood education seeks to encourage the total development of the child. This is achieved through attention to emotional, cognitive, social, physical and creative needs, and an understanding that the child is a unique individual. Our goal is to enable the children to develop a positive self-image and an interest in and respect for the world and their environment. ﻿﻿﻿As a parent owned and operated nursery school, GPNS relies solely on its members to carry out all non-teaching tasks necessary to ensure smooth operation of the school. All members of the preschool are required to participate on a co-operative basis. Parents assist in the classroom on a rotating basis, once or twice each month, and provide a nutritional snack for the class every other time they co-op. Either parent is welcomed and encouraged to assist in the classroom. Participate in the major fundraising event - our Annual Craft Fair held in November. Also, because communication is essential, attendance is mandatory at monthly membership meetings.